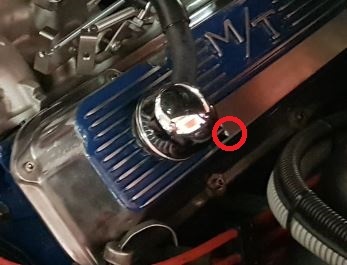 Bad gasket on the cap, or hose connection leaks, or the seam connecting the top and bottom of the cap is leaking. (07-13-2018, 07:58 AM)Don C Wrote: Bad gasket on the cap, or hose connection leaks, or the seam connecting the top and bottom of the cap is leaking. and your PCV could be plugged or malfunctioning. These old 1/4 turn oil fill caps are not like your new vehicle with a screw on cap with an o-ring seal. They will always leak. You could probably put a long tube like the racers use to and stop it some but without a great screw on cap and o-ring it is going to leak. Another thought, some aftermarket valve covers do not have a battle at the openings, so the cap and gasket are always drenched in oil. There is a plate so you cant see into the head, probably for protecting the oil from splashing out.